This is a really helpful article by the Happy Homemaker. Laundry detergent is really expensive. If you bought 5 gallons worth in the store, you’d be paying around $100!! Maybe even more than that depending on the brand. 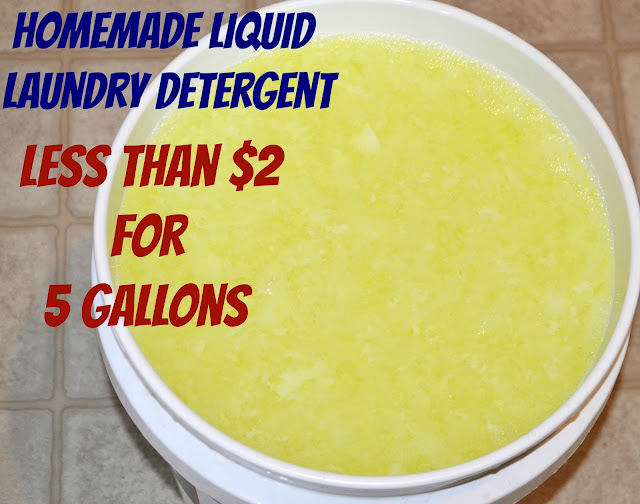 But, when you make your own laundry detergent – you can make 5 gallons for less than $2!! So the Happy Homemaker provides a simple recipe for liquid laundry detergent. It uses 4 ingredients (1 of them is water.) And you can add the essential oil of your choice for a nicely scented detergent. Natural and inexpensive ! Click on the Homemade Liquid Laundry Detergent link below to see the complete recipe.